Following on from our Pixiwoo feature last week, our 22nd Blog of the Week award goes to another established makeup artist who has been instrumental in making me somewhat proficient with a makeup brush. 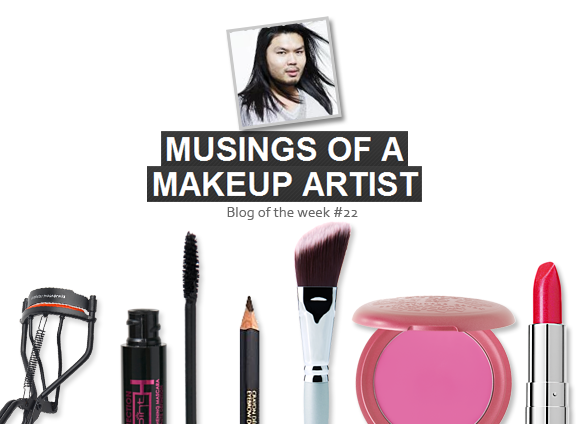 I’m talking about the brilliant Kenneth Soh of Musings of a Makeup Artist, a charismatic industry professional who is pretty much the fountain of all beauty knowledge. Everything that Kenneth writes about is so incredibly expert, from tutorials, to new products, to sneaky peeks at his editorial work. I especially love his fusion posts; the ones where he showcases his work and explains how he achieved the look. My favourite post is One Is Simply Not Enough: A Lesson in Makeup Layering, whereby Kenneth introduces a concept so foreign that it cannot possibly be true – mixing different textures, shades and brands to create a one-of-a-kind makeup look. In the post he details his work on a gorgeous model called Hannah, on whom he had used three (!) different foundations in order to address her different skin concerns. The result looks pretty damn beautiful, and not at all patchwork like you might expect. It encourages you to push the boundaries and get creative, and reintroduces the novelty and fun of makeup application – especially if you’re stuck in a bit of a rut. Kenneth encourages you to shake up your makeup routine and give everything a go – “Customise and mix your own palette of colours so it’s truly yours and yours alone. I don’t know about you but I find great joy in knowing that something I have is a one-of-a-kind and no one has the same!” – and you can’t say fairer than that! A definite must-read. This entry was posted on Friday, June 3rd, 2011 at 8:00 am and is filed under Blog of the Week. You can follow any responses to this entry through the RSS 2.0 feed. You can skip to the end and leave a response. Pinging is currently not allowed. My beloved BFF Kenneth and without question one of the best blogs out there! Wow I am so flattered that I’m in such good company with The Chapman Sisters. Thank you for being so kind with your comments and I shall hopefully continue to entertain with future blog posts.